get a constant beam of light. When turning the flashlight off, simply twist and then press the button on the base again and the flashlight will shut off. If only needed for a moment, the user can simply press the button on the base and then release. The bulb will stay illuminated as long as the button is held and then shut off when it is released. This 200 lumen flashlight will easily be a popular choice for anyone who does not want to sacrifice performance for the small size. The use of easily obtained batteries is also a nice touch for the average person who may want to keep this in a purse or their car. Most appealing is the fact that this flashlight is suited for a wide variety of consumers from mechanics and construction workers to mothers and office workers. It is also priced very reasonably so there is no need to spend a lot of money to get an excellent product. The Rayovac 200 lumen flashlight is a professional grade light designed to meet the needs of any job imaginable. Designed for agencies involved in tactical assignments and outfitted with a high performance Cree XRE LED, this is a high quality option for anyone in need of a compact yet powerful flashlight. Featuring a beam distance of up to 130 meters, this Rayovac 200 lumen flashlight is a powerful upgrade over any other compact light available on the market. The newest addition to the Rayovac line, this flashlight was specifically engineered to perform at a consistently high level over a long period of time. This focus on performance has lead to the inclusion of a water-resistant, aircraft-grade aluminum body to go along with the powerful 200 lumen beam. With an adjustable light power ranging from 70 lumens when placed on low to 200 lumens when placed on high, the Rayovac 200 lumen flashlight also features a strobe mode and the ability to the focus the light source from spot to flood. Rayovac also intelligently designed this flashlight to run on three AAA batteries as opposed to the frequently used CR-123, which is significantly more expensive and less widely available when compared to the AAA. 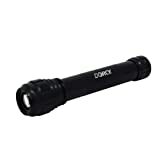 This allows the flashlight to have an impressively efficient run time of up to eight consecutive hours, more than long enough for any wide range of uses. While this Rayovac flashlight was designed for use in tactical assignments, it is nevertheless an impressive and valuable option for any consumer in need of a compact and durable flashlight. This light represents an incredible opportunity to own a professional grade tactical flashlight at an almost shockingly affordable price. This flashlight is a very sound investment for any consumer, professional or otherwise. Rayovac has long been known for its high quality product line. As an industry leader, the standards of the products they manufacture are without question and this flashlight is no different. 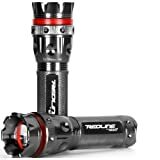 Offering superior performance coupled with impressive durability makes this flashlight an obviously sound investment for any consumer in need of a high performance and the best flashlight, but not all are the same. See the flashlight reviews for yourself here. I recently got the opportunity to try out the new tactical flashlight from Nebo, and was nothing less than shocked at what an awesome product it was. First off, I have used and abused more types of tactical lights than I can count with my fingers and toes in my military career. After checking this one out, I know which light will end up on my rack for my next mission, the Nebo Redline!Lets talk dimensions right off the bat. At just around 4.5 inches in length and 1.5 inches around, this full power, 200 lumen flashlight fits perfectly in your hands, and has a comfortable grip. With its compact size it can fit easily in a toolbox, glove compartment, or handbag. It weighs less than half a pound, even with batteries, so if you are planning on putting it to the test in a hunting, camping, or tactical environment it won’t weigh you down. Made from aircraft-grade aluminum, the Nebo Redline light is as tough as nails. I wrapped it against the hardwood floor a few times to test its durability, and it kept on shining. The Nebo Redline features five different light settings. The full 200 lumen flashlight setting illuminates a large area when adjusted to Nebo Redline has a super powerful LED bulb rated for 110,000 plus hours of usage. Across the board, this little powerhouse is made to last. Another feature that could come in handy is the face of the flashlight being designed for self defense. If you found yourself in a tight spot, one shot to the face with this light’s front cover would have an assailant rethinking their decision to confront you. You will not find a better, more powerful tactical flashlight, especially not at such a great price.floodlight mode, but can also send a powerful beam up 150 yards. With the three AAA batteries included with the light, I was able to use this flashlight for a full four hours. There are two other lower power settings to greatly extend battery life when full power lighting isn’t required, along with an SOS and emergency strobe setting. 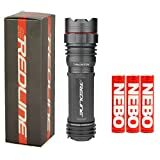 Although I didn’t personally test it, the Nebo Redline advertises 72 hours of use in both the SOS and emergency strobe modes. Bottom line: All 3 of these are great options for a 200 lumen flashlight and do have some pros and cons to each of them. Finding the best flashlight is a personal decision as much as it is technical. No matter which of these 3 you buy, I’m sure you will be happy with it.